Under the previous EPA Non-Hazardous Secondary Materials (NHSM) rule, treated wood was prohibited from being used as boiler fuel; however, EPA recently issued an amendment permitting creosote-treated wood to be used as boiler fuel under special conditions. Read the rest of our article in Waste Advantage Magazine online (http://goo.gl/8idkTR) or in the April 2016 digital edition (http://www.mazdigital.com/webreader/38250?page=35). Conversion Technology Inc. (CTI) is celebrating its 30th year of business. For the last 30 years, CTI has been assisting our clients across the United States achieve environmental and safety compliance. 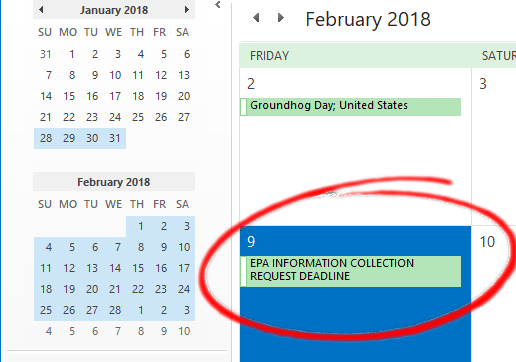 Webinar Replay – Boiler MACT Deadline is here. Are you in Compliance? If you missed our free webinar on Boiler MACT Compliance, you can stream it online now on your own time. To view the webinar visit http://ehsdailyadvisor.blr.com/2015/12/6761/ and register to view (or enter your email if already registered). If you wanted to have the presentation slides from the webinar, we have made them available here: 2016 Boiler MACT Webinar Slides. The Q/A for the webinar is available here: QA Boiler MACT Webinar. 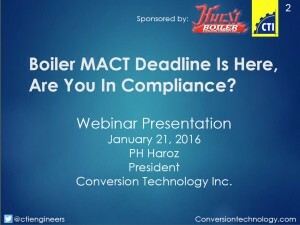 Free Webinar: Boiler MACT Deadline is here. Are you in Compliance? Sponsored by: Hurst Boiler and Conversion Technology Inc. Title: Boiler MACT Deadline is here. Are you in Compliance? Are your employees at risk of isocyanate exposure? OSHA has implemented a National Emphasis Program (NEP) to raise awareness of the dangers associated with isocyanate exposure. Isocyanates are hazardous chemicals that are often found in activities using paints, foam insulation, polyurethane, surface coatings, rubber, and adhesives. They are powerful irritants to the mucous membranes of the eyes, nose, and throat. Hazardous health effects associated with occupational exposure to isocyanates include irritation of the skin and mucous membranes, hypersensitivity pneumotitis (inflammation in the lungs), and chest tightness. A more serious hazardous health effect resulting from exposure to isocyanates is occupational asthma. Occupational asthma is an illness that can make it difficult to breath and causes chest tightness, wheezing, coughing, and shortness of breath. It is frequently serious and can be fatal. Isocyanates also include compounds that are classified as potential human carcinogens and have been known to cause cancer in animals.